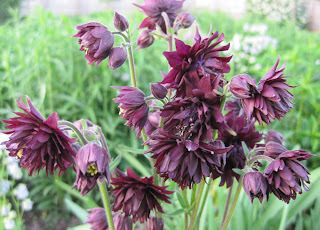 Early May in the garden belongs to the double-flowering columbines. I’m not sure how I ended up with so many of these fancy, frilly flowers, but I did. One of their common names is "Granny's Nightcaps", and looking at them, I can sort of see that. Very light, almost white flowers. These lovely pale blue flowers. Some stunning bright blue flowers. And these really dark blooms. How many of a type of plant do you need to grow in your garden to consider it "a collection"? Three, five, a dozen? I guess I have a small collection of "Granny's Nightcaps". But, I don’t consider myself a collector, regardless of how many varieties of a particular type of flower I'm growing in my garden. 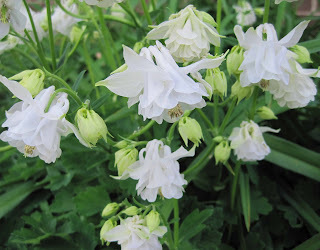 I just sometimes follow a theme by focusing in on one type of flower or plant group for awhile, like the spider-type daylilies, and the miniature hostas, and the Clematis with nodding, bell-shaped blooms, and now double-flowering columbine, to name a few. But I’m not collecting them. I’m just intrigued by them, following a theme. Yes, I’m just a gardener following some themes, trying to grow some interesting plants, this time in the Ranunculaceae family. These are such pretty flowers!! It is amazing the number of varieties of columbines there are- most that I have seen are the single petal. 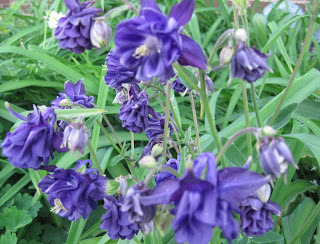 Carol, four years ago, I posted about the variability of my double columbines and there are even more variations now! One is striped blue and white. I love watching what comes up each spring. And I'm not a collector either. I just call it a unifying theme in my spring garden design. I like the name "Granny's Nightcap." I hadn't heard that before. I have a few of those Granny's nightcaps. It is funny that after all of these years of growing them this is the first year I have heard them called "Granny's Nightcaps". I have seen them referred to by this name several times on blogs. I like it. That white one especially looks apt. Those are spectacular. Keep collecting! I love how the columbines have sewn themselves throughout your garden and created their own collection. Sometimes nature does the collecting for you. Love the old-fashioned feel of these flowers. Those are pretty! Now I want to find some to put in my garden. I let mine go to seed too. I have pink ones which I don't remember ever planting.I would love to send you some this fall. Just say the word and they're yours. I love columbines. They might just be my favourite plant. I love columbine because they self-sow and interbreed so freely -- They breed themselves! If you just keep letting your favorite colors seed every year, pretty soon you'll have your own unique strain of columbines! You are soooo in denial! "Following a theme" - hah. You're a collector, which isn't a bad thing. (I'm not afraid to admit I'm a collector.) 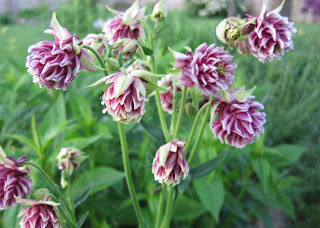 I wish we could get your Aquilegias together with my golden foliage ones. Double flowered golden foliaged bright blue ones and ruby ones would be fantastic. Those are really very pretty. I particularly like the pale blue ones. I collect daffodils. I admit it. I am addicted, badly addicted. I also collect day lilies, but not so assidously as daffodils. Oooh! I'm loving those. 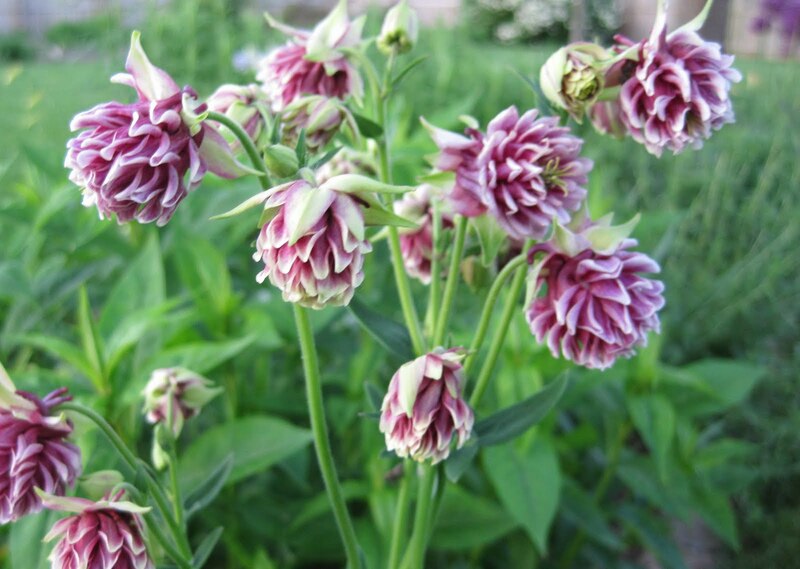 So far I can't even get single-flowering columbines to grow--even though everyone else in Austin can. 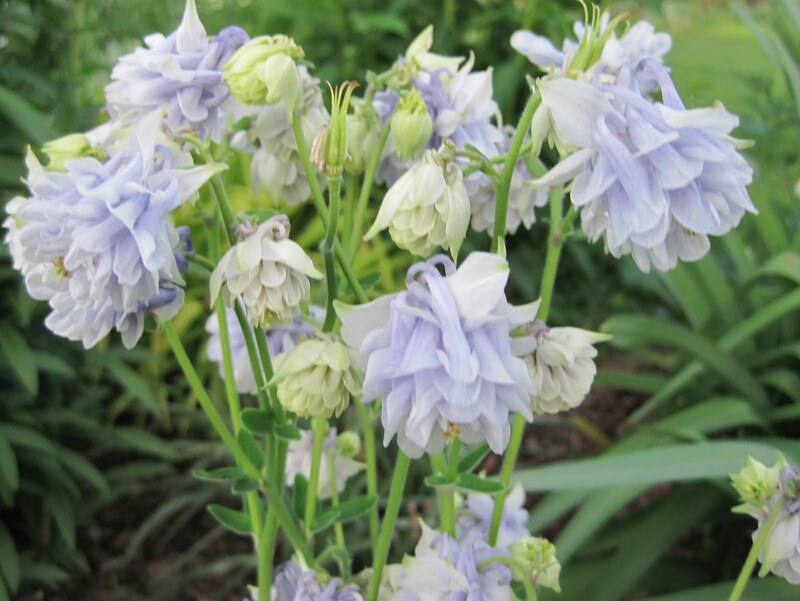 Your non-collection of assorted columbines are beautiful. But they don't look anything like a collection...why, no...not a collection at all! Are you resistant to the idea of being a collector? You seem resistant. Oh, wait. Was there irony? Did I miss irony?